Carlana Art Studio offers adults application of a special UV face paint, which glows when is illuminated with ultraviolet lamps, which are so popular now in nightclubs. If you use this unique product, you become a star of any disco, show or corporate event, where a UV-lamp is used. 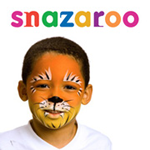 Carlana Art Studio uses only certified anti-allergic, non-toxic and water soluble paint for UV facepainting application produced by Snazaroo (England). UV paintings are easily removed with soap and water.